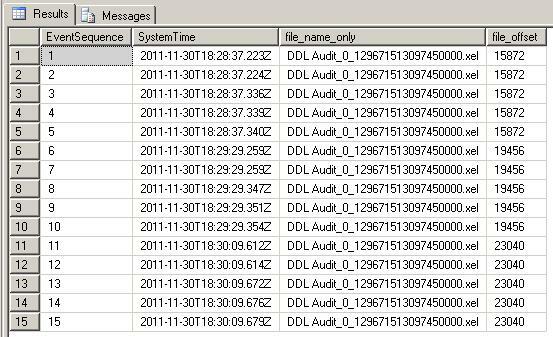 Home » Features » SQL Server 2012 – Bug in sys.fn_xe_file_target_read_file? 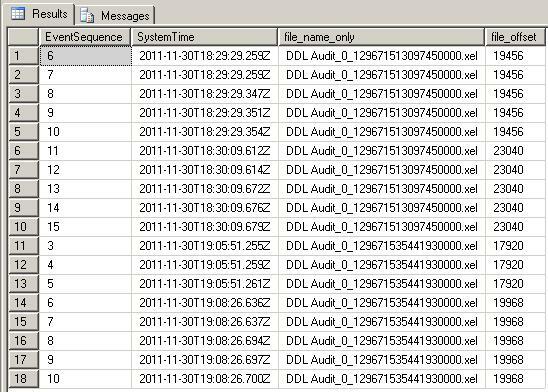 SQL Server 2012 – Bug in sys.fn_xe_file_target_read_file? So I finally managed to get my hands on a VM with Windows 2008 R2 SP1 so I could install SQL 2012. (Aside: one of the biggest obstacles to progress is bureaucracy.) Anywho, I plan to explore all of the new features and functionality in 2012 and, of course, blog all about it here. 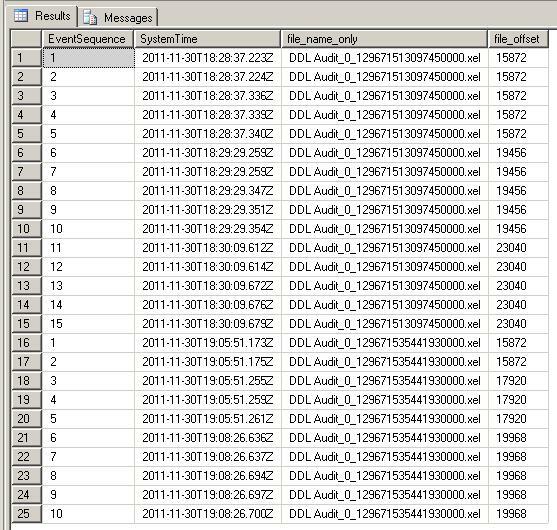 But I couldn’t resist diving in and checking out the newly expanded Extended Events in the hopes I’ll have something to add to my DDL Auditing presentation.Things were going well, I’d gotten the event session created and it was working as intended. One of the downsides to XEvents is that there’s no way to specify a table for your target. The best target for my particular scenario was an asynchronous file. Not ideal, but I can work with it. Still good. The problem starts when I have more than one file, which could happen with rollover, the instance restarting, or just stopping and starting the XEvents session. So let me do that and generate some more changes. Then I’ll rerun my initial query. It acknowledges the offset I specified, it’s only returning records after that offset. The problem is that it seems to be ignoring the initial_file_name parameter, because it’s returning records from both files. From everything I’ve read, I believe I’m using these parameters correctly, so perhaps there’s a bug in this version. Or maybe I am doing something wrong. Has anyone else out there had an opportunity to play with this and confirm or refute my findings? I’d love to get this working. This is a known bug that has been fixed in a future CU or SP for 2012. Thanks for following up, Jonathan.